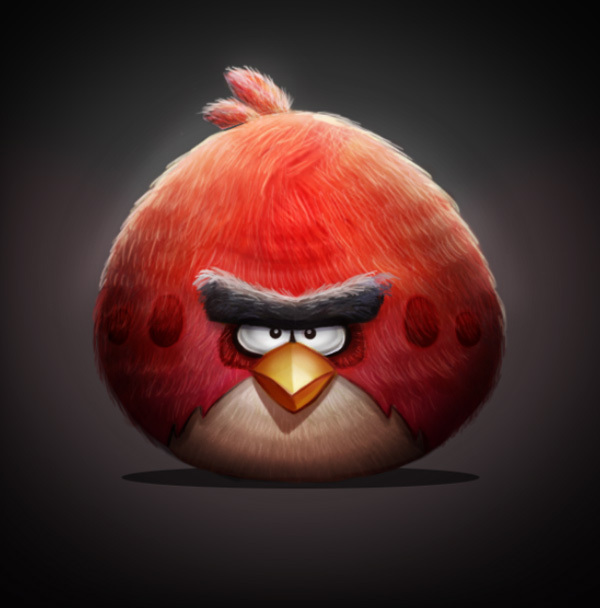 Love the Angry Birds? Well, this super addicting game is coming out with a movie very soon! To celebrate the wacky world of this game, let’s create some adorable fan art using Photoshop. In this tutorial, I’ll show you how to use photo textures to make your characters look realistic. Let’s get started! Create a New Document in Photoshop at 600×600 pixels with 300 dpi. 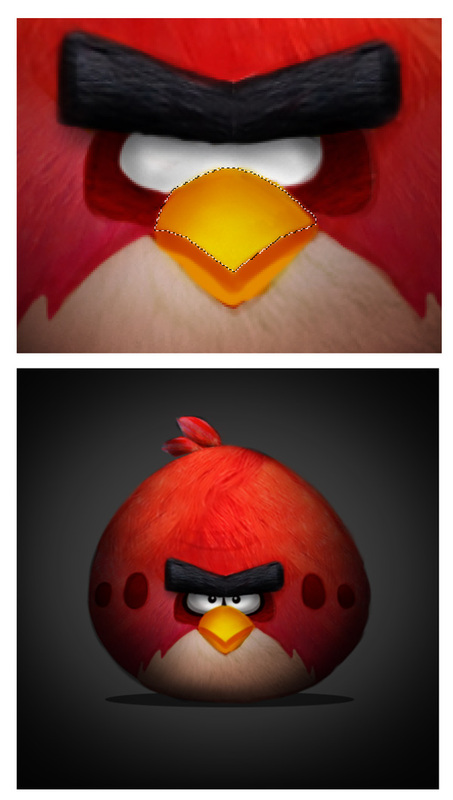 Gather some references of your favorite angry birds and pick one as the star. 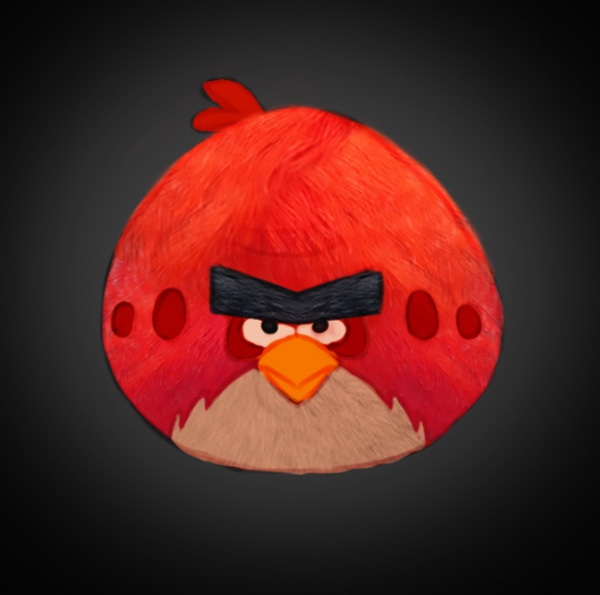 Here I’ll be sketching the main red bird. 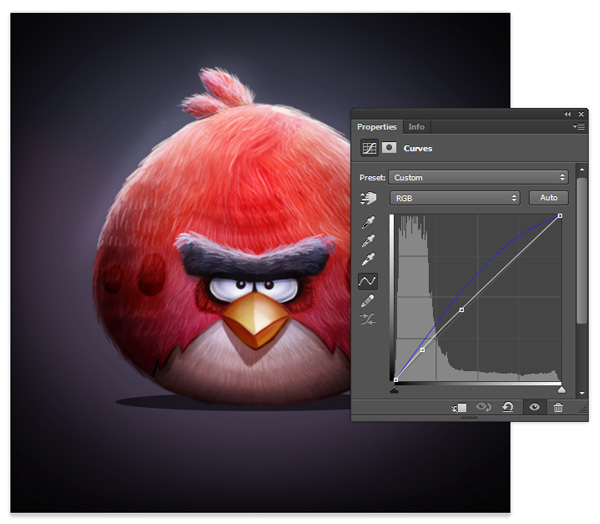 Use a Hard Round Brush to create a quick sketch of the outline of the bird on a layer separate from the background. Then fill in the face step by step. 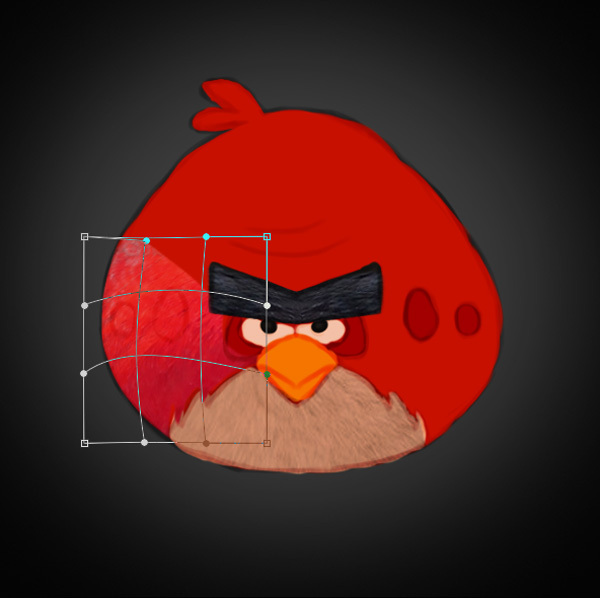 Use simple shapes to draw the eyes, brows, and beak. You can easily make things symmetrical by drawing one feature first, then duplicating and flipping it for the other side. Fill the background layer with black. Use a Soft Round Brush to paint one spot of white in the center of the background. Here is how you should organize your layers at first. It helps if you name each layer according to what it’s dedicated to, for instance, using the names “background” or “sketch” for their respective layers. Now let’s add some color. Use a Hard Round Brush to paint flat colors for the base of the painting on a New Layer underneath the sketch. To help the sketch blend into the base, simply set the sketch to Soft Light. 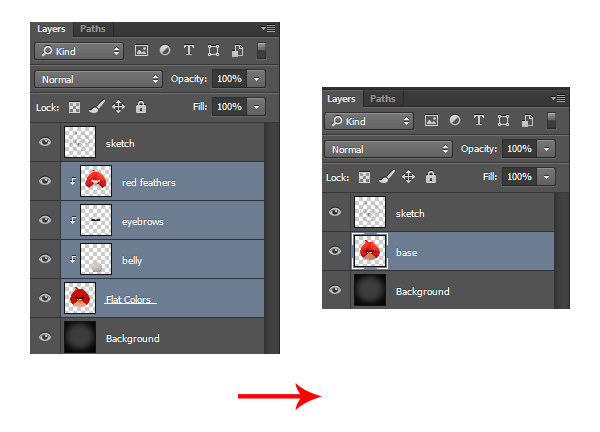 Below you can see the difference this change makes to help take away the harshness of the original black line. 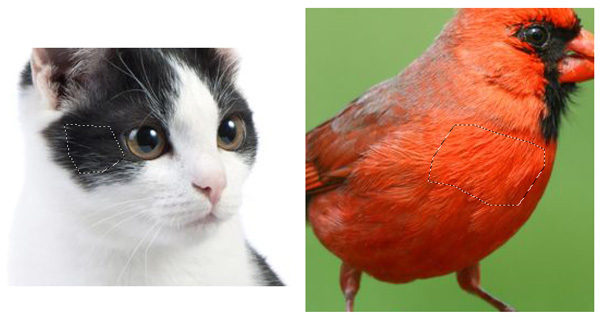 To make this bird look more realistic, we’ll be taking clips of feathers and hair from other photos to build the bird. First gather the references that’ll help you do this. 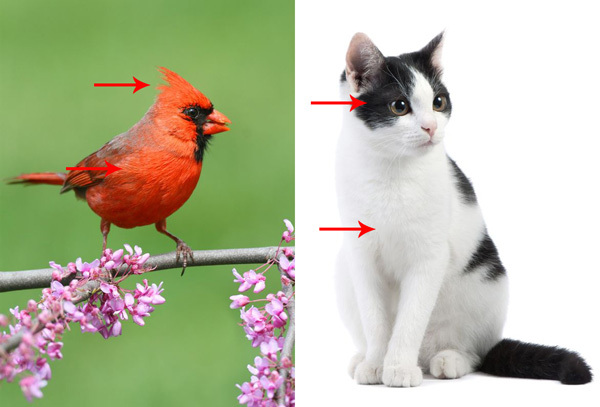 Since the red bird is based on the Red Cardinal I’ll be using one as a reference as well as a cat. The areas where the arrows are pointing are where I’ll be grabbing these textures. 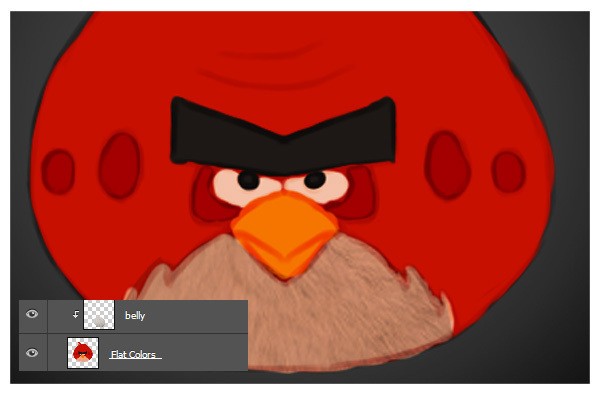 Use the Polygonal Lasso Tool (L) to create selections around the pieces of feathers and fur that you would like to use. 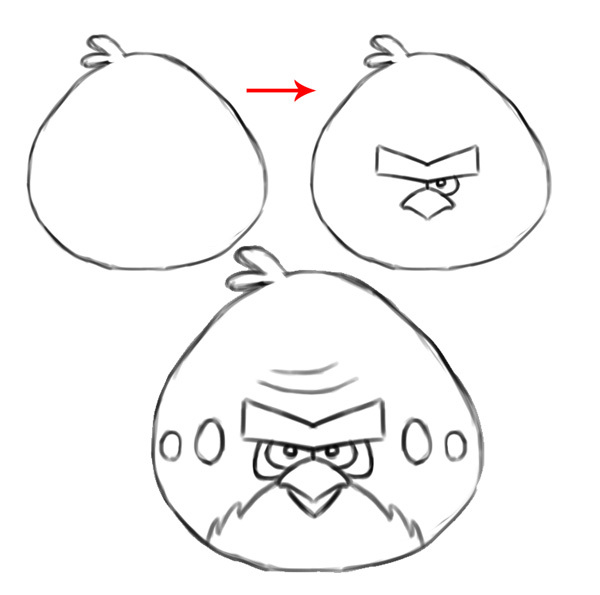 Copy and paste these onto the angry bird and use the Free Transform Tool (Control-T) to resize and adjust them into place. Let’s start with the cat references. Copy and paste them onto the document and set them as Clipping Masks to the colored base. Use the white hair for the belly of the bird. Clean up the edges with the Eraser Tool (E). Now use the black sections of hair for the eyebrows. Again, use the Eraser Tool (E) to clean up the edges. Do the same with the red feather references from the bird. In order to form the stock around the bird and make it look round, Control-T to Free Transform and select Warp. 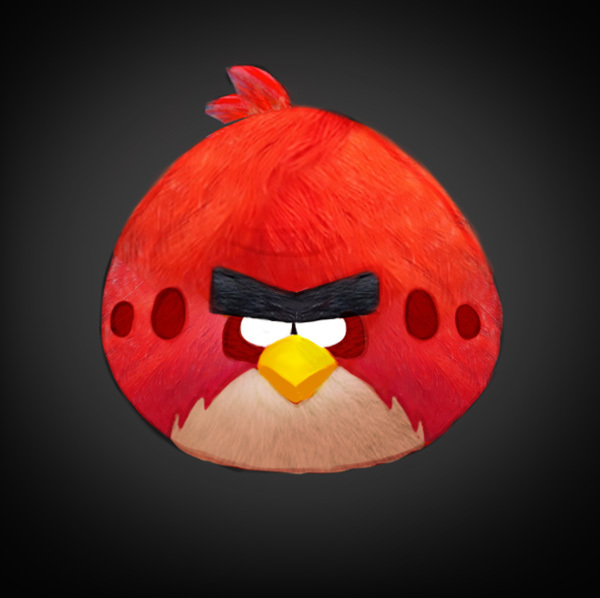 Continue to add more pieces of feathers to the bird, you can usually get away with using the same sections. Try to make sure they all look like they are wrapping around its body. Now it’s time to incorporate digital painting techniques to make this manipulation more 3D. Use a Hard Round Brush with a crisp edge of 100% Hardness to paint solid colors for the beak and eyes. Let’s add some shadows! 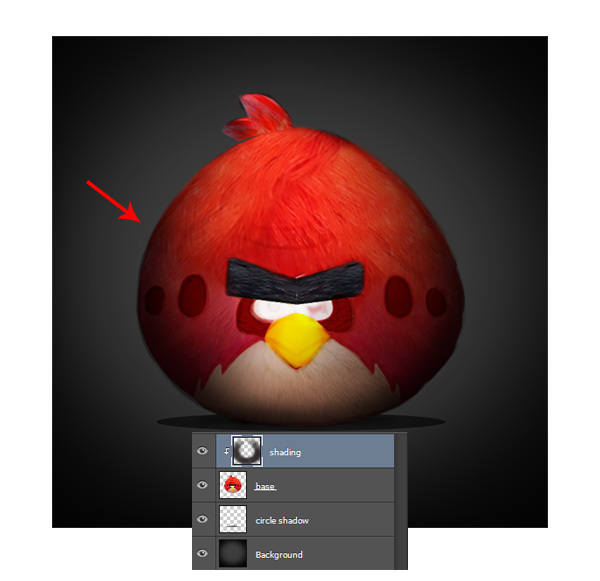 Use the Ellipse Tool (U) to create a circle of shadow underneath the bird. Then add a New Layer above the base and set it as a Clipping Mask to the base. 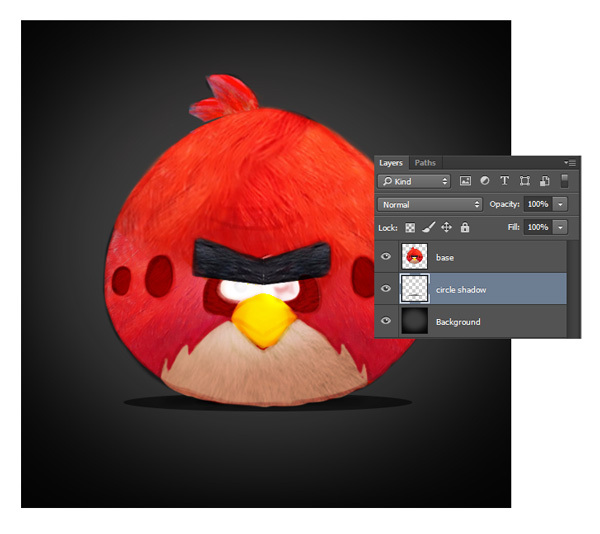 Set the layer to Multiply and use a Soft Round Brush to paint black shadow in a circular shape around the bird’s body. 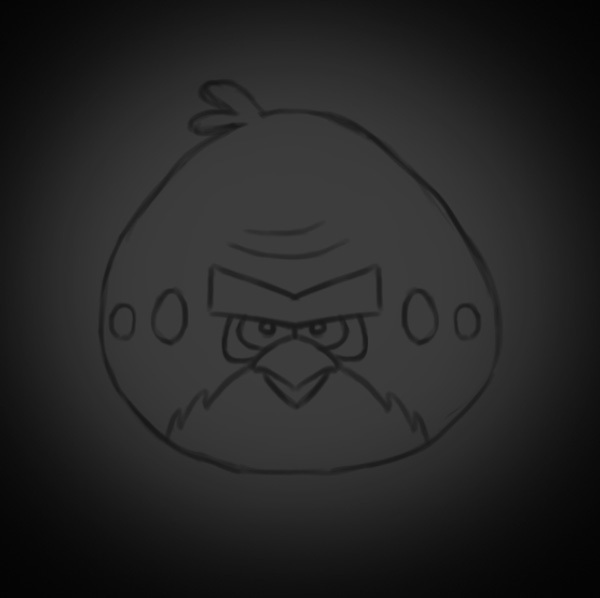 Continue shading the bird with black shadow until you feel it looks more round. Continue painting on more new layers set as Clipping Masks to the base. Use the Polygonal Lasso Tool (L) to create small selections around each feature. Use these selections to help you paint more shadows. By doing this, you keep the shadows within the selection and you don’t have to worry about creating a mess! Time for highlights! 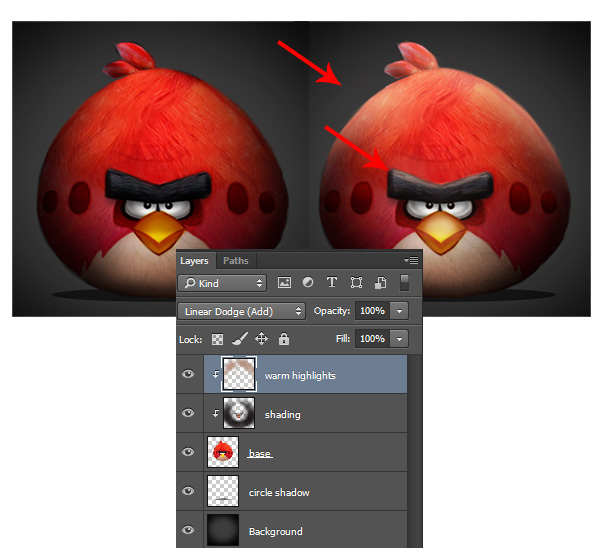 Set a New Layer above all your shading to Linear Dodge (Add) and use a light tan color to paint highlights on top of the bird. Bring some of those highlights down onto the brows and it will really push them forward. Elaborate on the texture of the feathers by painting highlights all over the bird on the same layer. 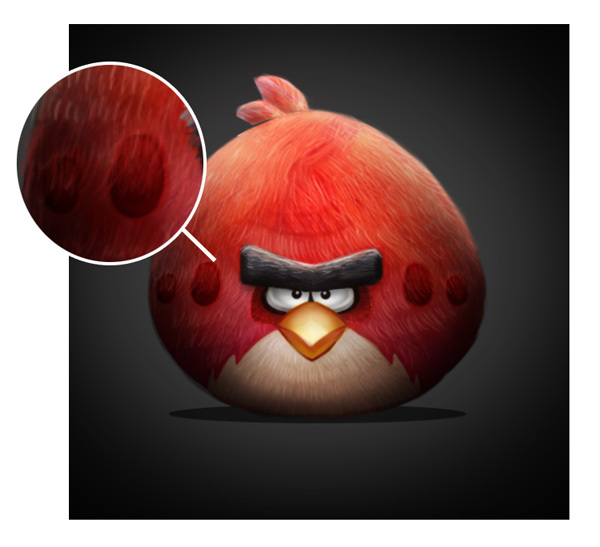 Use tiny white strokes in the direction of the feathers to make them pop out. Give some love to the edges too! Paint that feathery texture along the edges so that it doesn’t look like a clean line. It helps if you paint white highlights on the top for a cool rim light effect. Almost finished! Merge all the layers together and continue to refine your awesome fan art. 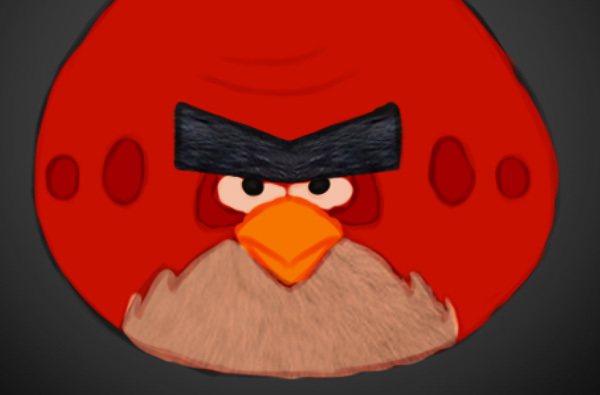 Add some dramatic shadow underneath the beak for more character. Use a Hard Round Brush to make sure your edges are crisp all around the bird. For the last step, create a New Adjustment Layer of Curves. Adjust the curves for the RGB and Blue Channels to add bright blue tones to your art to balance out the warm ones. 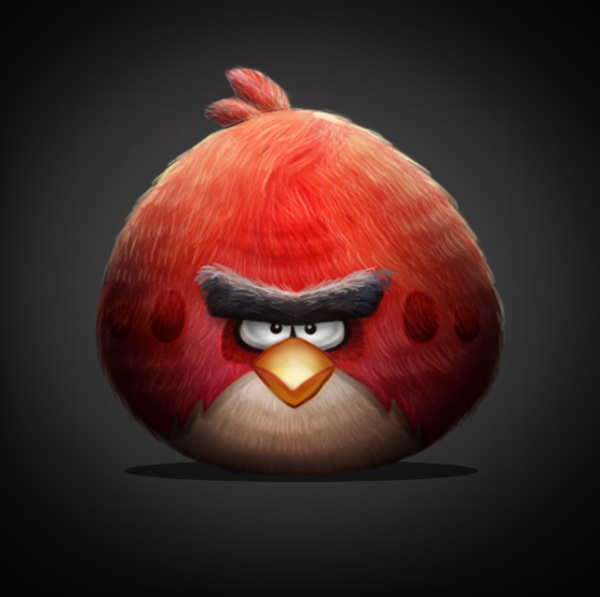 When you’re finished, get ready to load your angry bird up into a launcher for some destruction! I hope you’ve enjoyed this fun tutorial. (Psst, we have more here) Use these same techniques to create your own fan art for any of your favorite characters. Good luck!